The three members of the Trio Isimsiz are pianist Erdem Misirlioglu (well known to Stansted audiences), violinist Pablo Hernán Benedi and cellist Michael Petrov. They met and started playing together during their studies at the Guildhall School of Music and Drama. The trio have participated in masterclasses with the Belcea, Endellion and Takács Quartets and with Pavel Gililov, Wolfgang Reddick and Thomas Riebl at the Mozarteum in Salzburg. 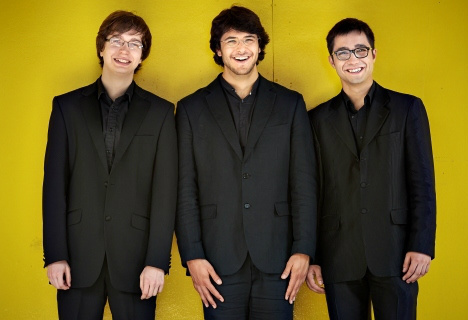 In 2013 the Trio undertook a residency at the Banff Centre for the Arts working with Henk Guittart and were selected for representation by YCAT (Young Classical Artist Trust). Over the last year they have given recitals throughout the UK including Wigmore Hall, the Barbican, Royal Festival Hall, Purcell Room, Barber Institute Birmingham, The Sage Gateshead, Brighton Dome, Colston Hall Bristol, the Lower Machen and Portsmouth Festivals. They have taken part in masterclasses with Menahem Pressler at Wigmore Hall, Steven Isserlis at King’s Place and the Gould Piano Trio at Dartington. Engagements this season include a residency in Aldeburgh, and recitals at Wigmore Hall, Barbican, Colston Hall Bristol, Purcell Room, Newbury Spring Festival, Peasmarsh Festival and the Festspiele Mecklenburg-Vorpommern. All three members of the Trio Isimsiz Piano Trio enjoy great success individually. Erdem Misirlioglu was a Concerto Finalist in the BBC Young Musicians Competition in 2008, Pablo Hernán Benedí is a member of the Chiaroscuro Quartet, formed by Alina Ibragimova, and Michael Petrov represents the UK in the European Concert Halls Organisation Rising Star series during the 2014/15 season. Pablo Hernán Benedí (violin) was born in 1991 in Madrid. He studied at the C.I. Padre Antonio Soler Conservatory in San Lorenzo de El Escorial and at the GSMD with David Takeno. In 2010 Pablo became a member of the Chiaroscuro Quartet, formed by Alina Ibragimova, Emilie Hornlund and Claire Thirion, appearing at major venues throughout Europe. The Quartet’s debut recording was released in 2011 to critical acclaim. Michael Petrov (cello) was born in 1990 in Bulgaria. He studied at the Yehudi Menuhin School and at the GSMD with Louise Hopkins, winning the Gold Medal in 2014. Over the last year he has made his debut with the Philharmonia, Royal Philharmonic and English Chamber Orchestras. During 2014/15 he gives recitals at major concert halls throughout Europe as part of his nomination by the Barbican Centre as an ECHO Rising Star. Erdem Misirlioglu (piano) was born in 1990 in Suffolk. He studied with Mark Fielding at the Junior GSMD and since 2008 with Martin Roscoe and Ronan O’Hora at the GSMD. In 2008 he was a Concerto Finalist in the BBC Young Musicians Competition, performing Rachmaninov’s Rhapsody on a theme of Paganini with the BBC National Orchestra of Wales. He recently won 1st Prize in the Beethoven Piano Society of Europe’s Intercollegiate Piano Competition.